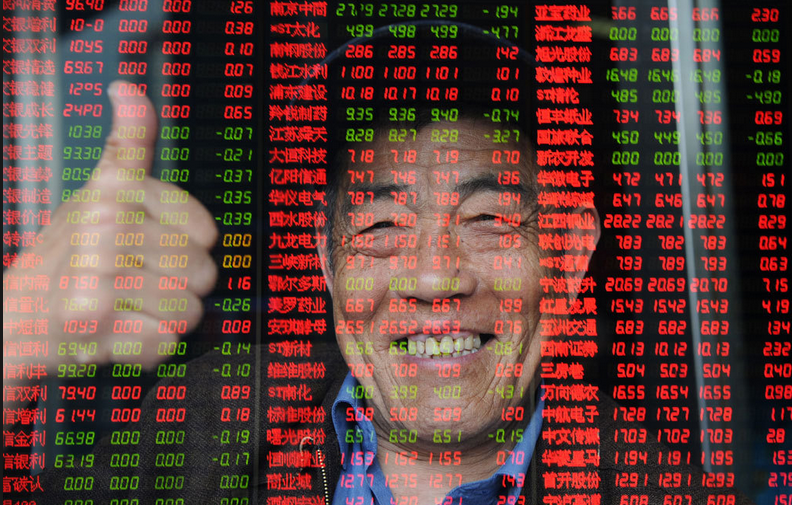 Chinese stocks returned to positive territory by midday after dropping sharply during Wednesday's morning session. The benchmark Shanghai Composite Index slipped more than four percent after the opening bell, indicating deepening downward pressure on the world's second largest economy, Xinhua news agency reported. The decline narrowed later, led by a rebound in banking stocks. China CITIC Bank at one point gained more than 1 percent, and Bank of Beijing gained 0.11 percent. Before the bell sounded, ending the morning session, the Shanghai Index had gained 0.31 percent to end at 3,176.34 points, and the Shenzhen Component Index edged up 0.46 percent to close at 10,209.32 points. The ChiNext Index, China's NASDAQ-style board of growth enterprises, gained 1.96 percent to close at 1,926.61 points. Winners outnumbered losers by 602 to 283 in Shanghai, and by 1,001 to 354 in Shenzhen. Shares in the Internet sector and food security led the gains, while oil stocks were among the biggest losers. The government has ramped up efforts to bolster the economy and promote the steady and healthy development of the capital market. On Monday evening, the central government issued a notice encouraging mergers, cash bonuses and share repurchases by listed companies to expedite reform of state-owned enterprises and stabilize the stock market. Official data released on Tuesday showed China's manufacturing purchasing managers' index (PMI) fell to its lowest level in three years in August, at 49.7, also down from 50 for July, suggesting contracting pressure on the manufacturing sector.